i've EXPERIENCED, first hand, the life-changing before & after of simple, effective marketing. Working on my business not in my business. Marketing that is effective, simple & profitable. Working A LOT but seeing few result. Worrying about $$$ money, a lot. Wondering... am I doing this right? Spending countless hours each week on Instagram/Facebook posts. No views on my website or social media converted to sales. Marketing was spilling over to my personal life. intensive & focused training to move your business forward. you're going to love this! Feeling in the flow of your life, rather than struggling to make time. Feeling Confident about your business marketing strategy - to be able to share with close friends/family, as well as strangers! can unlock all that for you! What's the format of marketing made simple? Marketing Made Simple is a 6-week group coaching program where Elise walks you through the process of setting up or strengthening your business's marketing systems. 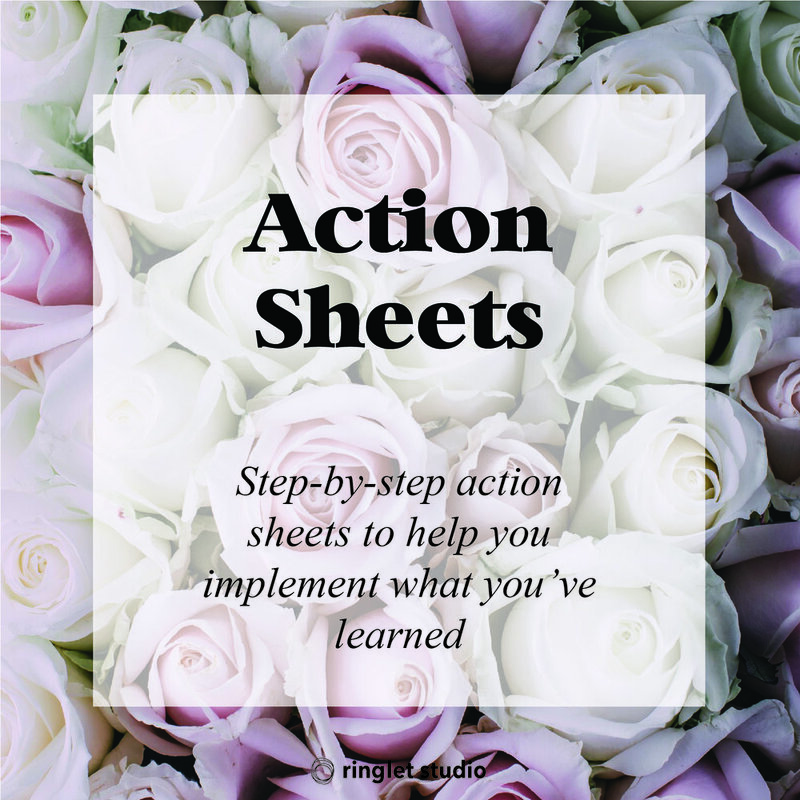 Every Monday of the program, you'll receive a link to an audio lesson, incredibly insightful PDF and actionable worksheets. Then, you can hop on over to the exclusive Marketing Made Simple Facebook group to chat and strategize with the other 14 entrepreneurs in the Marketing Made Simple coaching program and get feedback from Elise on all the work and implementation you've done that week. Then, once a week, Elise will hop on a call with everyone in the group for further discussion and to answer any questions. What's the benefit of marketing made simple? You might be in a place in your business where you're not quite ready to hire Elise and her team for digital marketing services. Marketing Made Simple is your chance to tap into all of Elise's expertise at a lower price point. You still get the benefit of Elise's personalized attention, advice and strategy without buying The Simple Solution package. You will have all of your marketing systems in place by the end of Marketing Made Simple. Although you will have to produce content, you will be have automated systems in place so that you can spend more time dong what you love. You will have conquered marketing and know exactly how to bringing revenue online. how is marketing made simple different from other programs? Where as other group coaching programs try to cover all. the. things. (sales, social media, client work, ect.) Marketing Made Simple focuses solely on nailing down your marketing systems. Marketing Made Simple is kept small (no more than 15 people in the program) so that you have benefit of an intimate setting: getting personalized feedback and guidance from Elise and insight from other Marketing Made Simple participants. The price of this intensive of a program and guidance from Elise is usually well over $2,000 but to make this program more accessible, Elise has priced it at ONLY $497. will marketing made simple work for me? While there are no guarantees in this program, there is no question that whether you are four years into your business or just starting out, that overcoming marketing overwhelm is going to accelerate your business to earn more cash and connect with your ideal audience. Our goal is to get you to the point where you feel comfortable running your marketing, creating content and have automated marketing systems in place that save you time and help build your reach online. Figure out why you might not be converting viewers to clients & how you can optimize your website for an amazing user experience. Most group-training programs are thousands of dollars and take months to complete. But we want to empower you, not make you go broke! We've streamlined our marketing systems so that you can learn from Elise in the shortest amount of time in the most effective way possible. Imagine having all of your marketing systems in place for 2017 and not having to worry about them from here on out. The Kicker? There are ONLY 10 spots available in the Marketing Made Simple group program! Don't let someone take your seat! Registration closes February 24th, 2017. Marketing Made Simple Begins March 6th and ends April 14th. Still have questions? Feel free to email Elise at elise@ringletstudio.com.